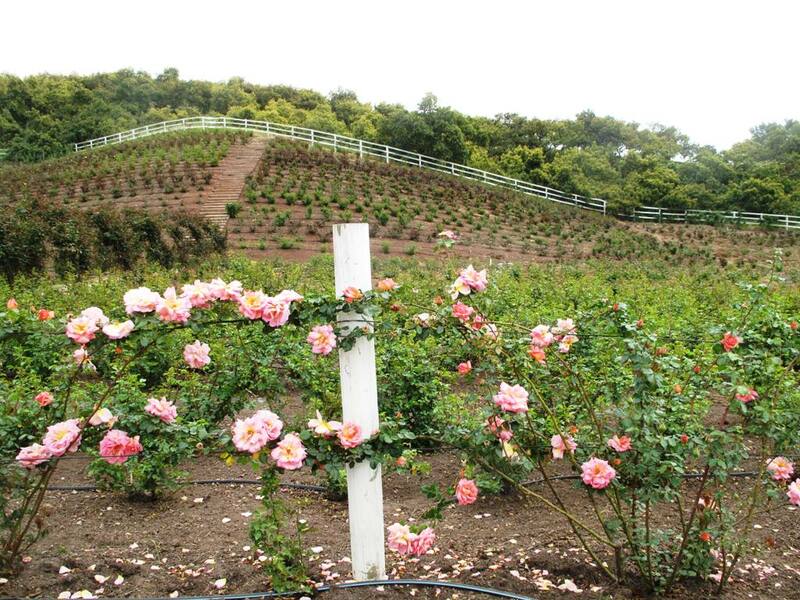 Tours focused on the entire process – from planting and growing to harvesting and grading. Mums, also known as pom poms, are one of the last commercially grown flowers still grown in soil. 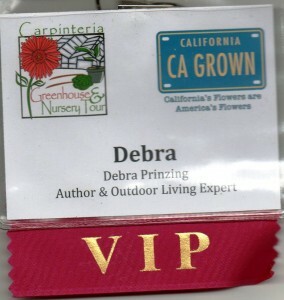 Fun to wear the VIP badge! 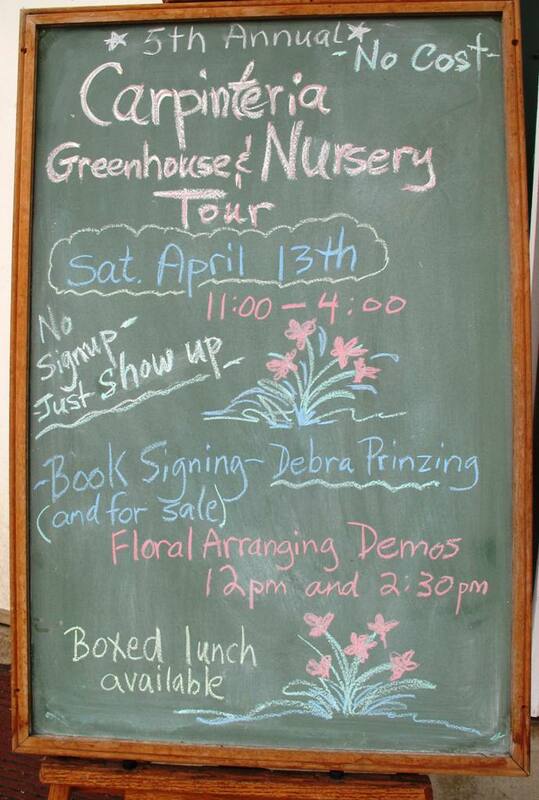 DAY One: Carpinteria Greenhouse & Nursery Tour, sponsored by the California Cut Flower Commission. I was hosted by Harry and Michele Van Wingerden, the great folks at Myriad Roses and Padaro Floral Design for a day of book-signings and eco-floral demonstrations. A special thanks to the Van Wingerden family, CCFC CEO/Ambassador Kasey Cronquist and Event Planner Anna Kalins for making it a successful and enjoyable day! 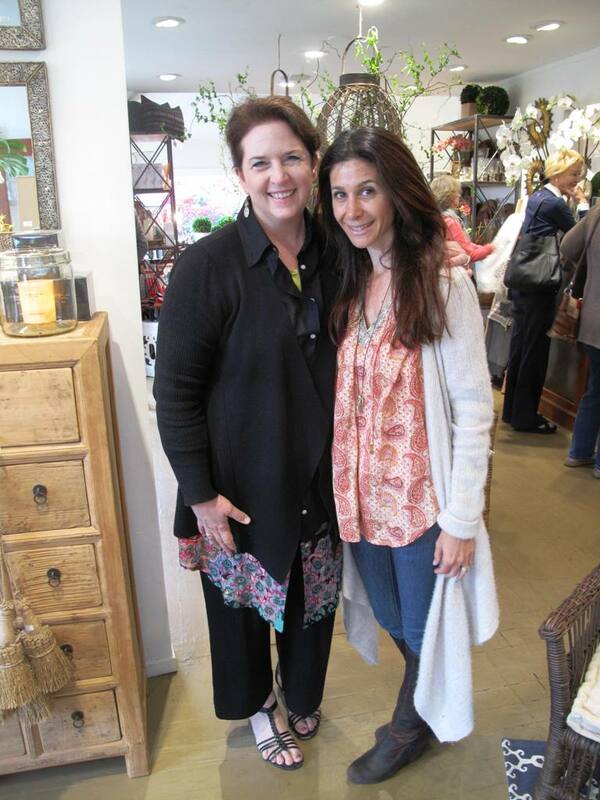 Erin Taylor, designer of flowers, interiors, landscapes and more~ The talented owner of botanik in Summerland, California hosted my lovely book event. DAY Two: Book signing and flower demos at botanik in Summerland. Loved spending time with very talented owner Erin Taylor and her team. After several hours at botanik, I met up with Cristi Walden and we headed to Sea Crest Nursery, her father Jack Stevenson’s palm and cycad collection. It was so exciting to return to this beautiful place and hear how my talented friend is learning the business of growing and selling amazing landscaping plants (oh, and propagating, too!). 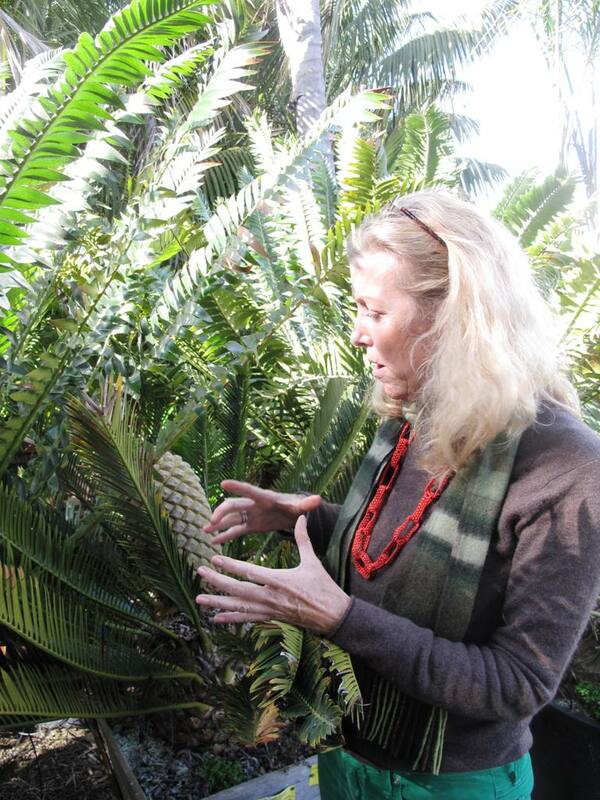 Cristi Walden of Sea Crest Nursery is explaining to me how she propagates cycads. It is not an easy thing! Early blooms cascade over the fence at Rose Story Farm. DAY Three: No lectures, demonstrations or book-signings today (whew), but I had a major highlight with a stop by Rose Story Farm located in Carpinteria. Owner Danielle Hahn hosted me for a lovely lunch, a tour through the impressive growing fields and a lively discussion about English garden roses for the cut flower industry. This is a magical place worth adding to your bucket list~ I previously blogged about after visiting in 2007. Dreamy, inspiring, unforgettable! Dinner and a sleepover in Thousand Oaks, with our favorite former neighbors, the Polkes family, was a sentimental moment. I drove quickly past our old house on Via Verde and tried not to feel too sad about leaving the neighborhood and friends where we lived for four years. LA Farm Girl blogger and garden writer Judi Gerber and I have been friends on FB, but we met for the first time at my Flower Duet event. And guess what?! She won the floral arrangement! DAY Four: Heading south down Hwy. 101 to I-405 . . . to Torrance in Los Angeles’s South Bay where I joined Kit Wertz and Casey Coleman Schwartz, owners of Flower Duet. These talented women are custom floral designers and educators. 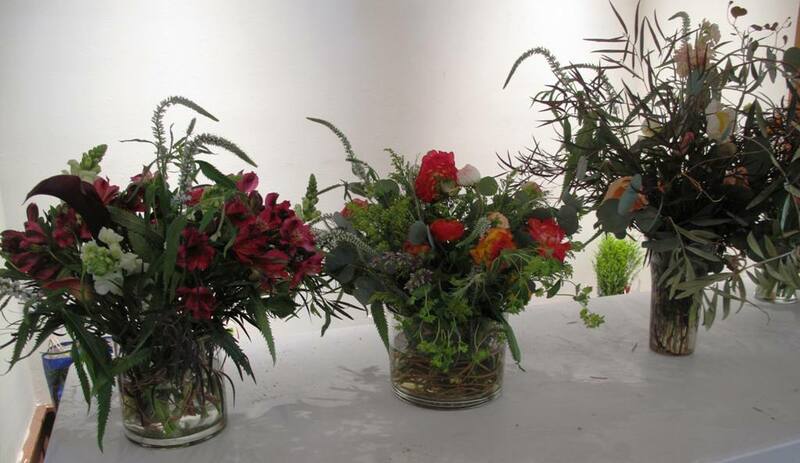 They teach DIY designers and pros alike, taking the mystery out of flower arranging for hundreds of students each year. Their studio was a perfect spot for me to talk about “Slow Flowers” and meet many of their students and colleagues. Kit and Casey put on a fabulous evening, sharing food and wine, and good friendship with fellow floral enthusiasts. 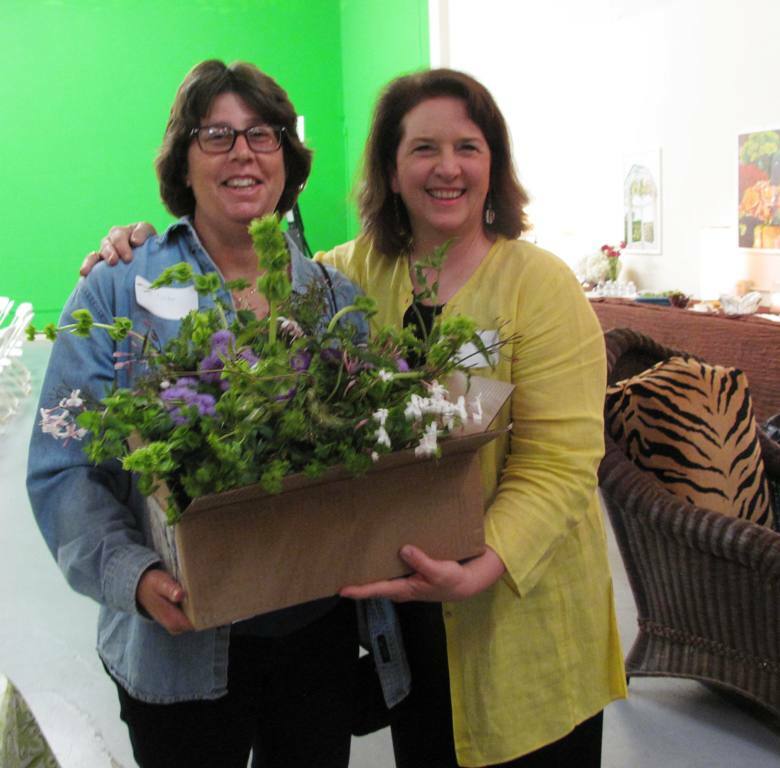 So much fun to meet everyone and to work with flowers and foliage provided by the Carpinteria farmers of CCFC. DAY Five: Next stop – San Diego! The invitation to speak to the venerable San Diego Floral Association was the impetus for the entire week’s visit to SoCal. Thank you to VP/Programs Sandra Dysart and to her fellow board members for giving me a wonderful welcome. I so enjoyed the sense of camaraderie and the kindred spirits who attended, including several people I’ve enjoyed meeting at other horticulture venues. Flower demonstrations are always fun and I especially loved working with local California-grown flowers from Dramm & Echter, a huge farm based in Encinitas. Can’t leave San Diego without thanking my hosts Nan Sterman and Curt Wittenberg, who put me up for two nights. And on top of staying with them, I got to visit with Hasan and Ayse Kayali, dear friends who are very special to Bruce and me. Traveling can be grueling, but having friends at the end of the road makes it so much easier, doesn’t it? 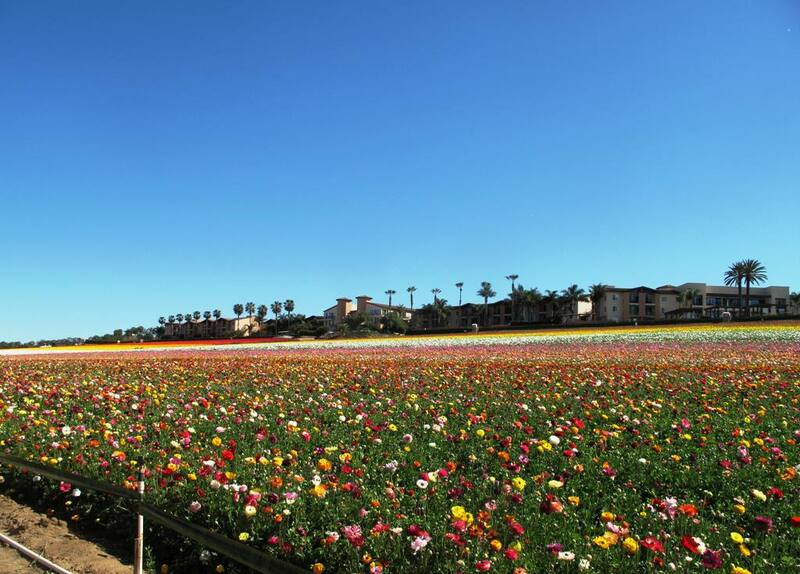 The Flower Fields, where a rainbow of ranunculus is on display, just to wow the viewer. One more stunning color-blocked section of ranunculus. 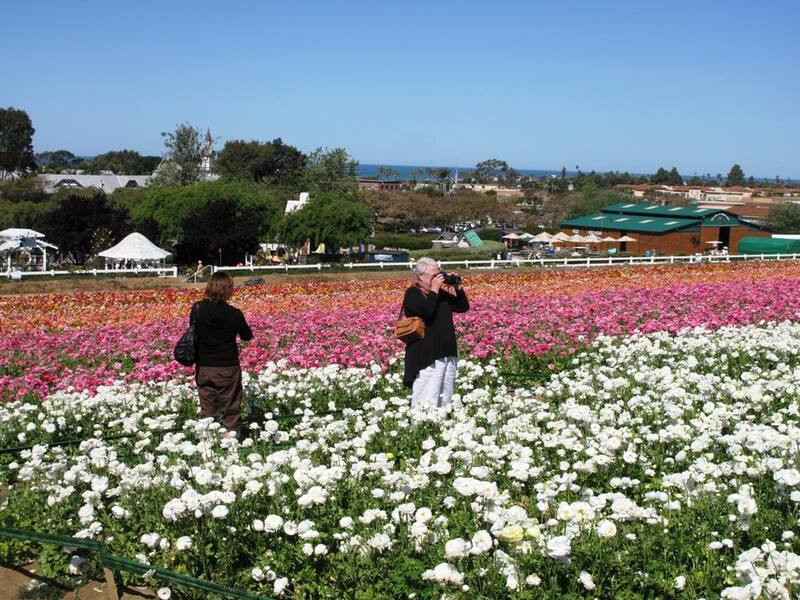 DAY Six: Before returning to Los Angeles, I was determined to visit The Flower Fields, a famous tourist destination where acres of ranunculus are on display each spring. You can read the entire history of this flower-centric venue. 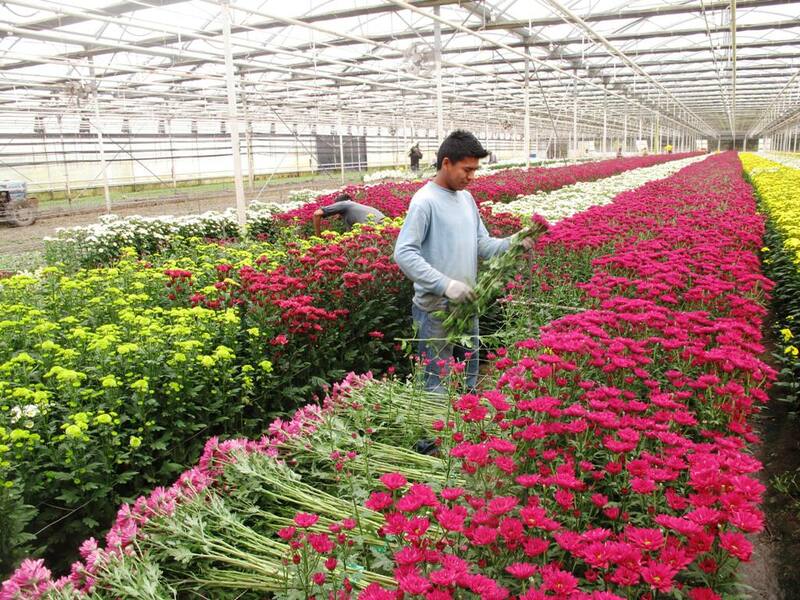 It represents the best of the region’s roots in floriculture and has something for all members of the family. Thanks to Mike A. Mellano, a fellow member of the Association of Specialty Cut Flower Growers, on the day I visited I was hosted by manager Juan Paz, who drove me around the acreage in his pickup truck. What a sweet guy! I saw Japanese tourists, school groups of children and teachers, people in fancy dress, guys in overalls who rode the vintage American tractors pulling wagon loads of tourists through the fields. . . and everyone was happy. That’s what seeing a beautiful field of flowers will do to your spirit. The vibe here is a little bit Disney, but who cares? It’s awesome. That evening, I arrived at Rolling Greens Nursery in West Hollywood, where events coordinator Angelena Moio and her colleague Raychel Walton had created a beautiful setting for me to make bouquets and sign books. All I can say is that Rolling Greens is pure inspiration for anyone who loves good design, uncommon plants and unique home and garden decor (old and new). It’s a great place to wander around looking for new ideas! I’ve written about this shop many times before. Thanks to owner Greg Salmeri and creative director Angela Hicks for making me feel welcome and for the beautiful marketing signage. DAY Seven: Up bright and early to shop at Mellano & Co. in the Los Angeles Flower District, where Bob Mellano and his staff (thank you, Ernesto!) go the extra mile to accommodate and support my BUY LOCAL efforts. 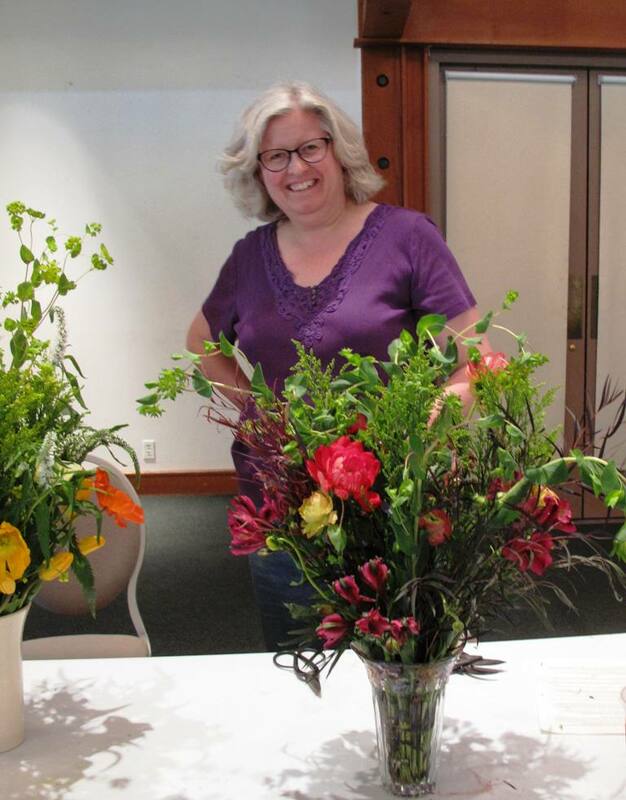 It was easy to select so many wonderful California-grown ingredients for my demonstration at Rolling Greens in Costa Mesa, as well as flowers and foliage for the following day’s workshop (see DAY Eight, below). 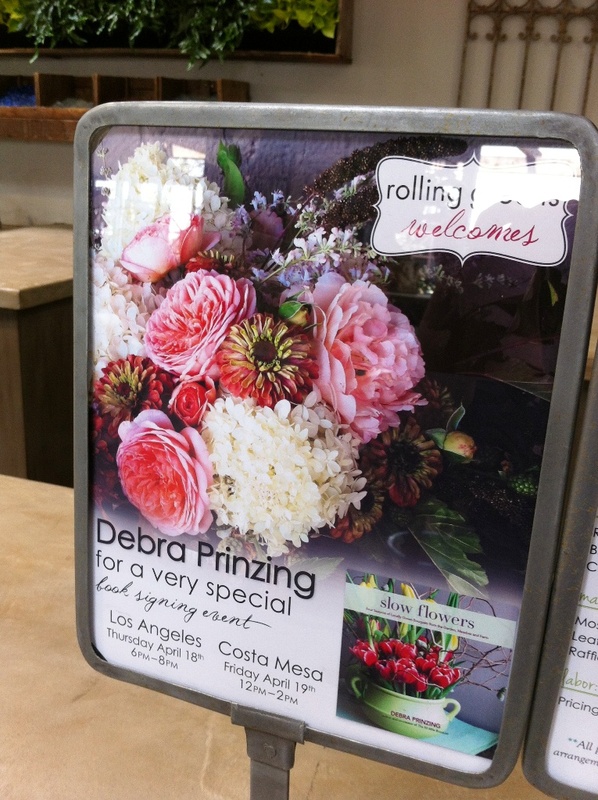 Angelena of Rolling Greens kept me company and we had a good time choosing such beautiful flowers. I had one more stop before my Noon to 2 p.m. event . 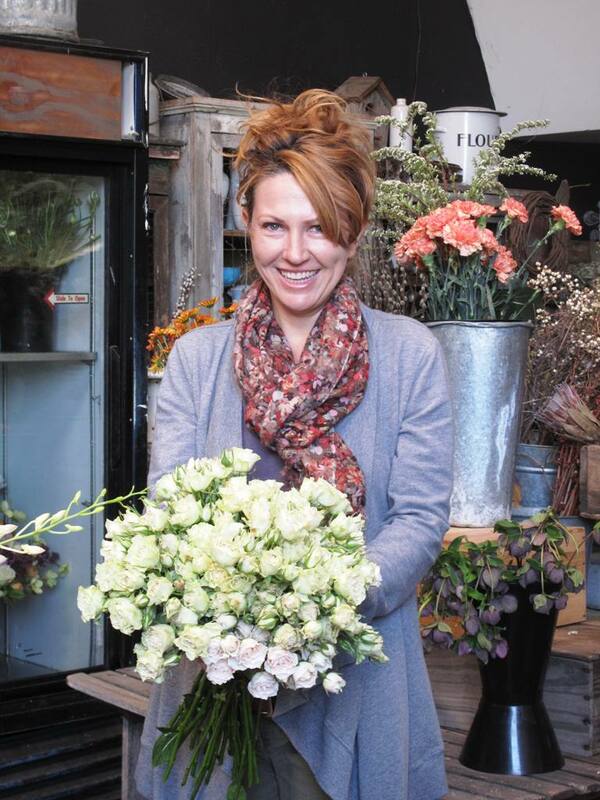 . .
Clover Chadwick, eco-floral designer and owner of LA’s Dandelion Ranch. Love her style! That was to stop by Dandelion Ranch, the flower studio of Clover Chadwick. I’d been wanting to meet this talented floral designer for the past few years, ever since I started reading about her work. Then my friend Cindy McNatt wrote an article about Clover for the Orange County Register and sent me a link, saying “you need to get together.” So . . . fortunately for me, Clover had a window in her crazy schedule and I was able to stop by while en-route to Costa Mesa. Clover is worthy of her own story, so I’ll just include a few photos of her and her quonset-hut headquarters in LA’s Baldwin Hills neighborhood. 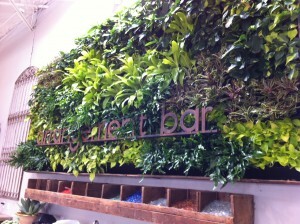 What impressed me the most about Clover is the way she works so closely with chefs and area restaurants. She understands that business and works to make the flowers an integral part of the setting, using local and seasonal ingredients. 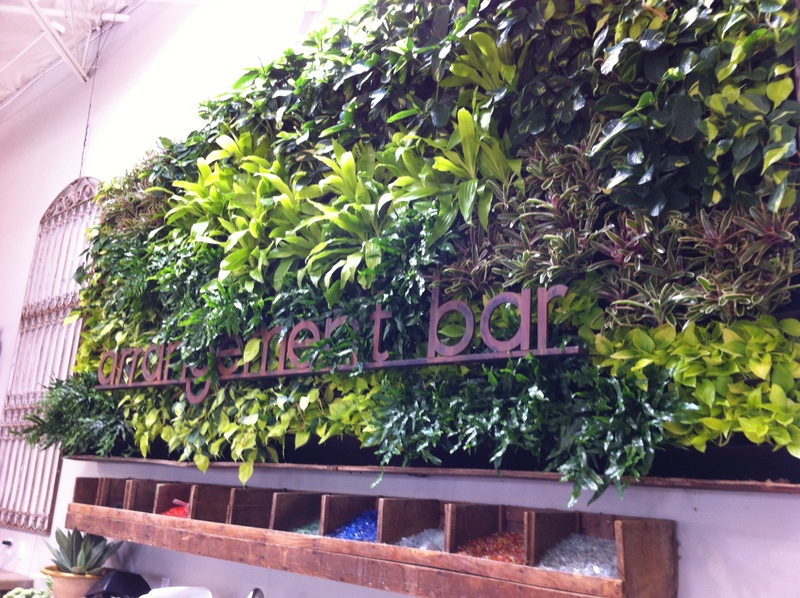 Thank you, Rolling Greens and designer Raychel Walton – great signage! Afterwards, a small, but engaged audience at Rolling Greens wrapped things up nicely. A fantastic staff, including manager Jim and horticulturist/rosarian Grace Rose (my new FB friend), and of course, Angelena, who was teaching a class of her own that afternoon. 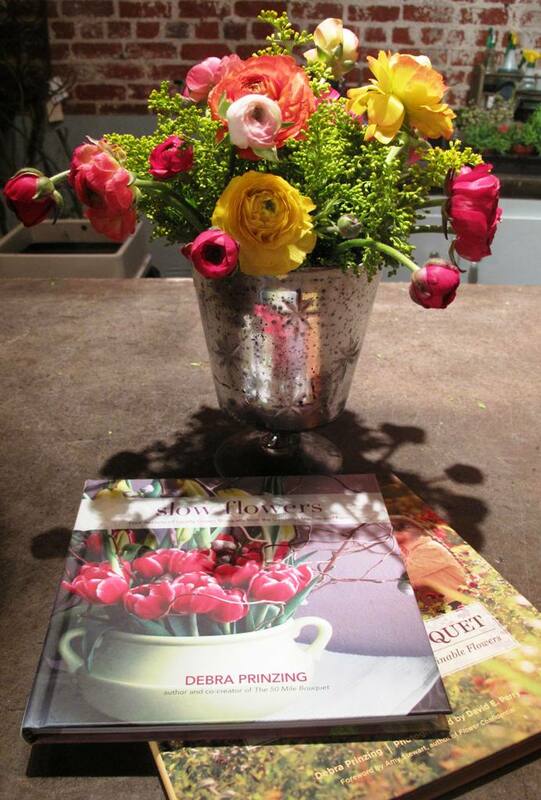 We kept things lively and had a great time talking flowers, succulents, vases and design. A late afternoon tea break with my favorite newspaper editor in Venice was yet another highlight. I am a grateful writer for those rare individuals who support and encourage my reporting and storytelling interests (not to mention my obsessions). He is one of them. One of the students in the DIY-design workshop at Descanso Gardens – she’s so pleased with her creation! More beautiful DIY bouquets from students who participated in my eco-floral workshop at Descanso Gardens. Good morning, Los Angeles! My final full day of speaking has arrived. The day was both energizing AND filled with a fun surprise reunion (aka a blast from the past). 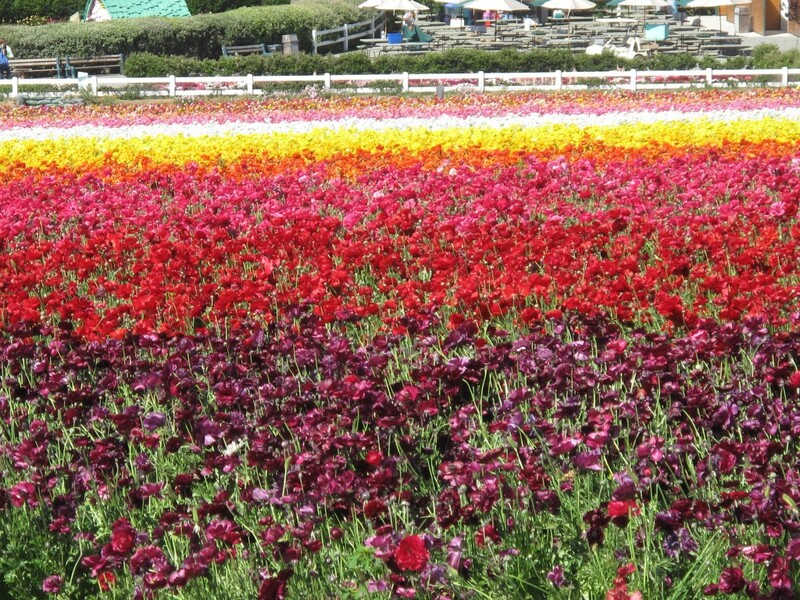 First of all, I had to load all the buckets of flowers back into the ridiculously small Fiat rental car, along with my luggage, and head off to Descanso Gardens. Friend Jennifer sent me on my way with a to-go mug of tea and that made the drive go quickly. (That and driving on Hwy. 101 before 9 a.m. on a Saturday). I had time to stop at Starbucks for a 2nd cup of tea AND to pick up the day’s print edition of the Los Angeles Times. Hey: Guess who wrote the cover story of the Saturday Section? It’s so rare these days that I get to see my articles in print versus only online. Such a thrill! You can read the story about architect John Frane’s Venice house here. 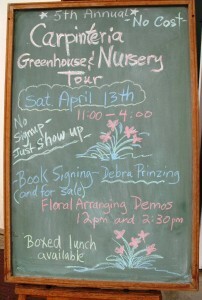 At Descanso, education director Lisa Kursten met me and helped me unload all my tools, vases, flower buckets and more. The botanical garden’s Earth Day celebrations were ongoing last Saturday and I kicked it off with a morning eco-floral design workshop. Twelve students – all super talented (see photos!) and positively enthusiastic about using garden-fresh, California-grown floral ingredients. After a lunch break, I gave a lecture on the “Slow Flower” movement; many of the morning design students stayed and we had a nice group. One audience member kept catching my eye and I started wondering . . . was she the blonde California native I worked with back in the late 1980s/early 1990s as a young business reporter in Seattle? After my talk, she approached. YES~ It was Lorianne Denne, a friend from my formative journalism years. We worked together at Puget Sound Business Journal and during much of that time we were the only women in the newsroom (which was an instant bonding experience). Lorianne reminded me that I gave her a going away party in 1991 when she moved back to Southern California after her 8-year experience in Seattle. We didn’t stay in touch. Remember, this was pre-email; pre-texting. It simply was harder to stay in touch and easier to drift apart. But as I told her, when we sat together in the Descanso Gardens’ sunshine and enjoyed some ice tea after my lecture, there are a few touchstones here in Seattle that never fail to bring her to mind. Lorianne is now an English teacher, and I was so excited to learn that she’s engaged about to get married in June. It was a high note to reconnect. Good times. Lots of laughs. Important memories from our early career lives. 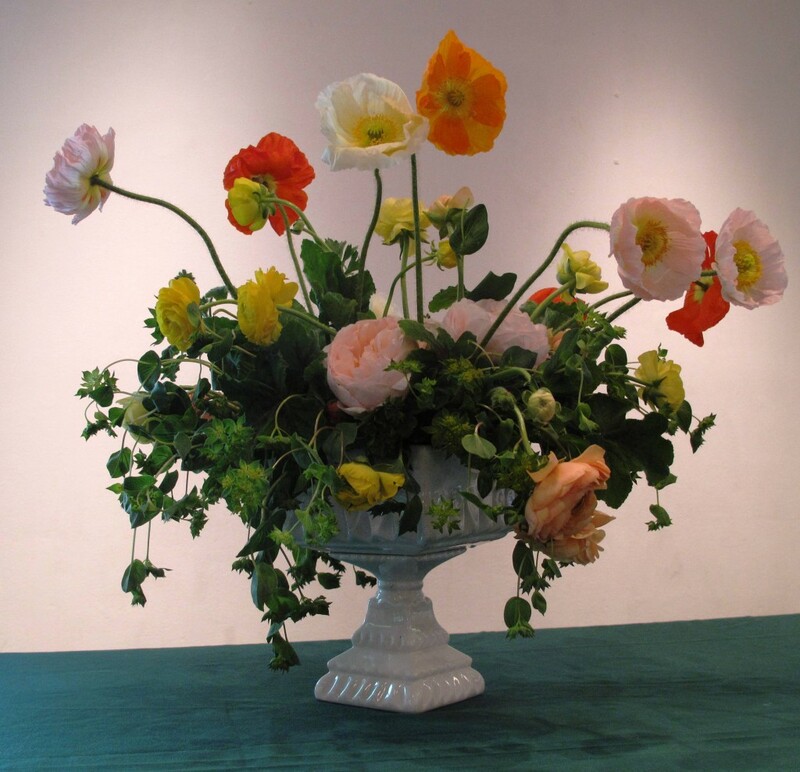 My California spring bouquet, including poppies, ranunculus, bupleureum foliage and geranium foliage. That evening, I landed at my final stop. Dinner with Paula Panich, who I call my writing mentor. Before going out to dinner, we spent time in her beautiful garden, enjoying the late afternoon light (taking lots of photographs, because Paula has agreed to let me write about her garden), and also catching up with her husband, Bill Linsman. Paula and Bill often take me in and give me the relaxing bedroom in the corner of their home that has vintage windows that swing open and overlook the front garden. I felt pampered and rested, even though I had to rise at 4:45 a.m. to get off to the Burbank Airport for a 7 a.m. flight to Seattle. That was a long trip. Yes, I was in SoCal to promote “Slow Flowers” and sell/sign as many books as possible. But as you can see, there was much about this trip that was NOT work, but more about plants, gardens and friendships. Gotta laugh at his honesty! This entry was posted on Wednesday, April 24th, 2013 at 9:44 pm	and is filed under Creativity, floral design, General, Plants, Playfulness, Writing. You can follow any responses to this entry through the RSS 2.0 feed. You can leave a response, or trackback from your own site. What an amazing trip! great pictures too! It was sure fun to have a VIP at this year’s Carpinteria Greenhouse & Nursery Tour. 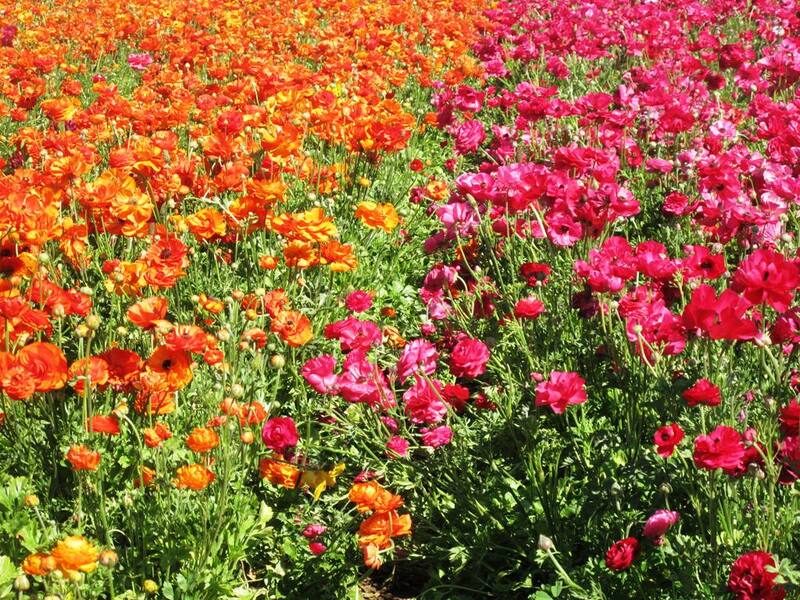 Thank you for all of your hard work to promote local American Grown flowers, supporting our family farmers. What a wonderful adventure! Thanks so much for sharing just a few of what must have been tons of hightlights! Oh, yes, those teenaged boys know just the words to put their mothers’ hearts at rest. I figure, they don’t know how good they have it unless Mom leaves every once in a while so they know what they’re missing. Debra, what a wonderful adventure for you and all those who connected with you.. wish I was in your suitcase. Your are my flower mentor, as you know, Hope to see you soon.